I paused at Sandy Crossing quite early one morning last week for this photo. 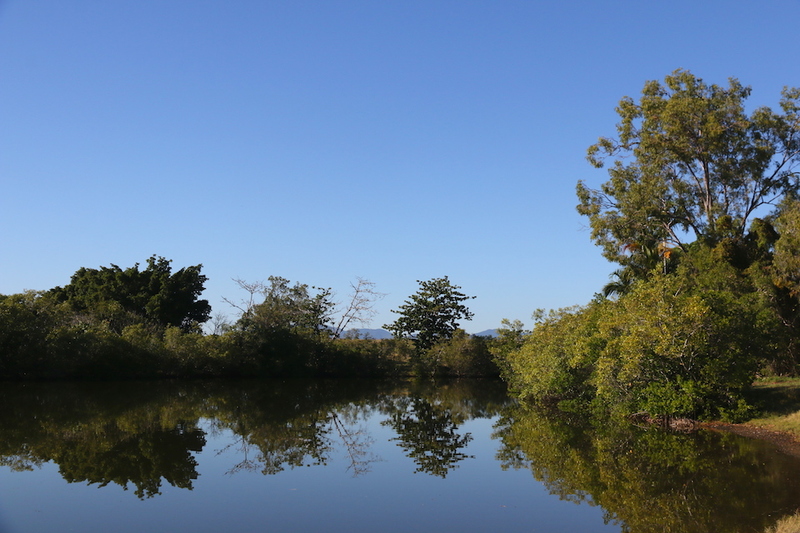 The dew was still on the grass and the birds were moving around the mangroves – Brown Honeyeaters making far more noise than their size seems to warrant, as they so often do; a Rainbow Bee-eater perching watchfully on the power line; and a little gathering of Woodswallows not far away. 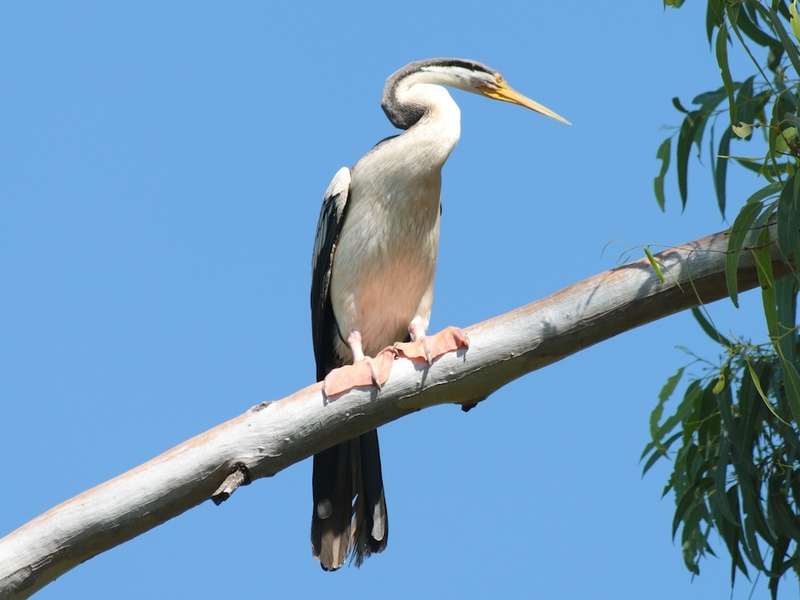 Author malcolmPosted on June 8, 2017 Categories Birds, Nature photographyTags Dry season, Ross Creek, seasonal changeLeave a comment on Ahhh… winter! 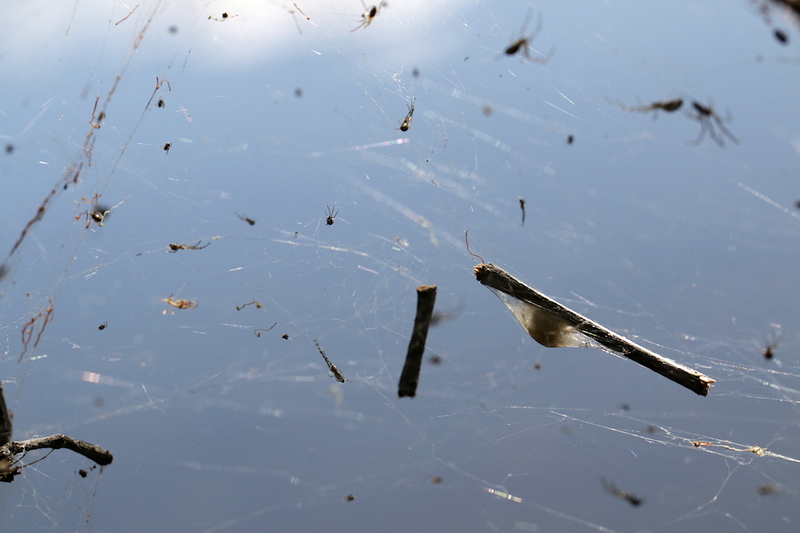 When I looked more closely I saw long skinny orange-brown spiders (1), lots of smaller chubbier charcoal-white patterned spiders (2), and a few very small ones (3); also lots of egg sacs woven onto twigs. I reckoned that (3) were very young juveniles, that most or all of (2) were sub-adults and that (1) were adults, all of one species. “Which species?” is the obvious question. Not so obviously, why did all the adults I photographed happen to be males? Do sub-adult males change from type (2) colours to type (1) with their last moult, I wondered, while adult females remain type (2)? 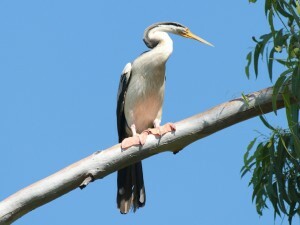 Identifying the adults to genus level is easy, since the enormous jaws are very distinctive. 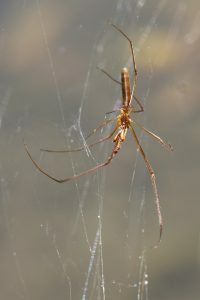 They are in the genus Tetragnatha in the family Tetragnathidae. Both genus and family have the common names ‘Four-jawed Spiders’ (an exact translation of Tetragnatha) or ‘Long-jawed Spiders’. Beyond that, identification is less certain. 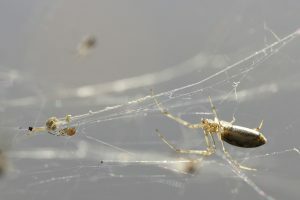 They may be Tetragnatha nitens, T. rubiventris or another close relation (follow this link for photos of each species). On a second vist two weeks later I saw many adult females with the reddish coloration, so any gender imbalance was only temporary. 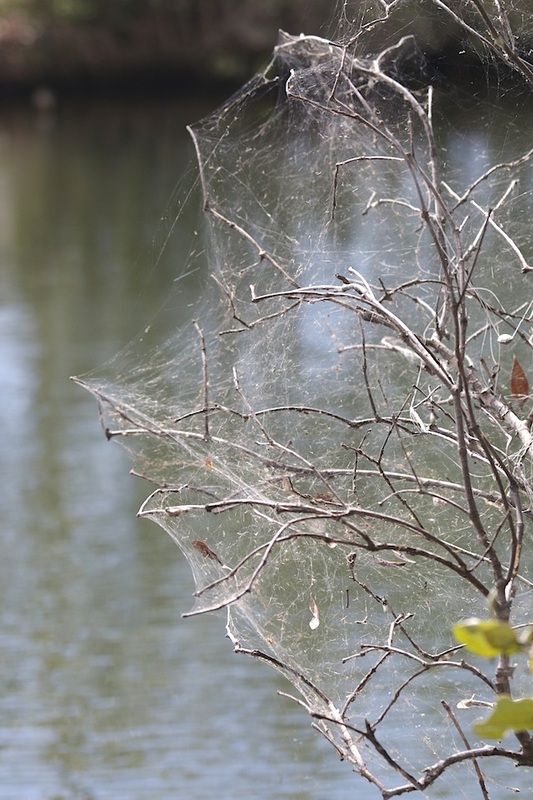 The webs were just as extensive and the egg-sacs even more numerous, although spider numbers seemed to be a little reduced. I normally see adult spiders in this family as individuals (e.g. 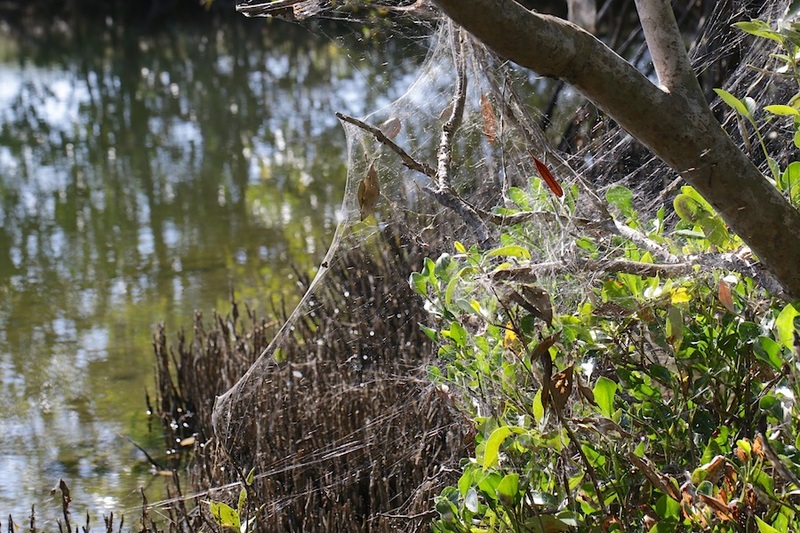 this collection), often well away from water and often with hardly any web, let alone a tent city like this. The expert I call on for things arachnological suggested that this could be a local ‘population explosion’, for whatever reason. He hadn’t heard of it with this genus but says it does happen with others, mentioning one of the St Andrews Cross species as an example. What will happen here remains to be seen. I will call in again and report back … if I emerge alive. I’m just joking, of course – they are completely harmless, and the biggest risk to me is that I will fall in the creek while trying to take a better photo. 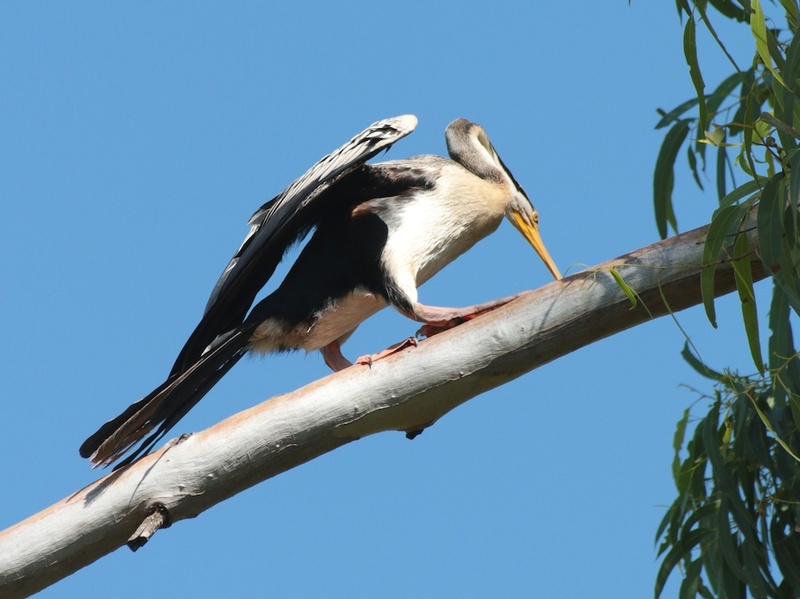 … and stropping that imposing beak can bring out a surprising resemblance to dinosaur ancestors. 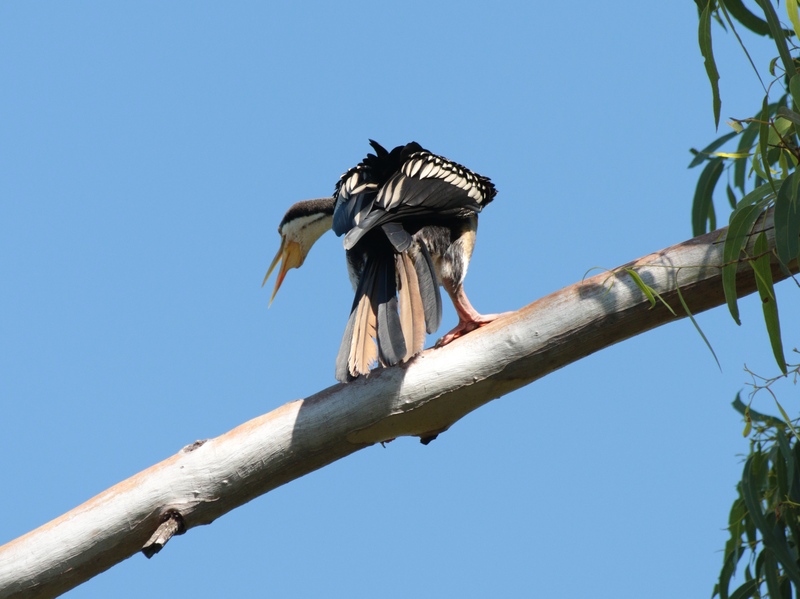 I stopped at Sandy Crossing, where Queens Road crosses Ross Creek, on Friday afternoon and saw this Australasian Darter (Anhinga novaehollandiae) drying her wings at the water’s edge, shrugging them out like washing on a line as they do. After a few minutes she flew up onto a lowish branch of a nearby gum tree. I couldn’t help taking a series of photos. They are best viewed in the lightbox – click on any one of them for a larger image, as usual, and scroll through. 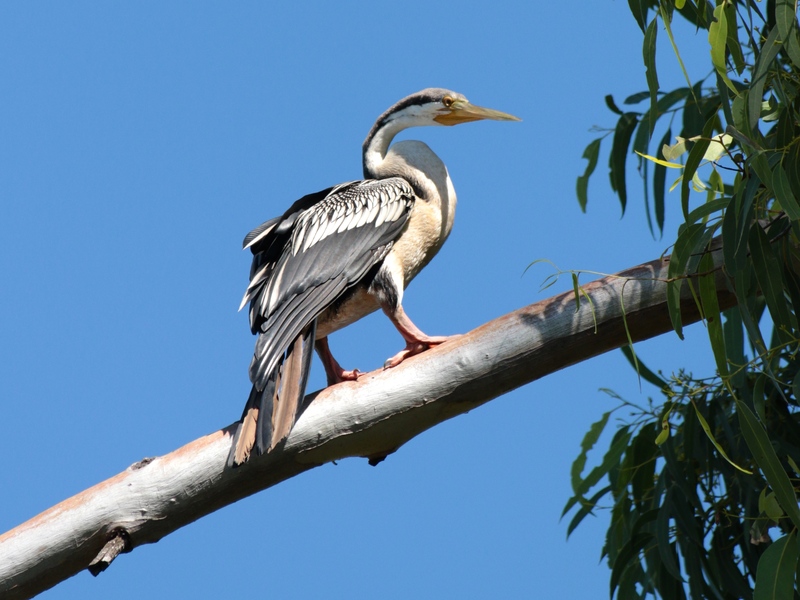 The species was formerly known as the Australian Darter, Anhinga melanogaster, but, as Birds in Backyards notes, what used to be one species is now three and A. melanogaster is now only the Asian branch of the family.